Sean Kelly is delighted to announce a new exhibition by Wolfgang Laib – Frieze of Life – which will feature new work as well as one of the artist's iconic pollen installations. The opening will take place on Thursday, October 29th, from 6pm until 8pm. The artist will be present. 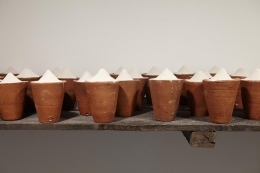 Frieze of Life will focus on Laib's life-long connections to nature's most fundamental materials – specifically in this case, pollen and ash. Pollen, symbolizing the origin of life, will be utilized in the main gallery with a large-scale pollen field installation. It has been 23 years since one has been exhibited in New York. To create the work, the artist will sift hazelnut pollen, which has been painstakingly collected by hand in the fields near his studio in Germany, onto the floor of the main gallery. 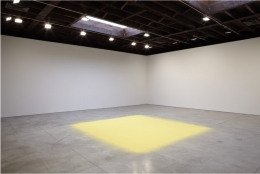 The presence of the pollen creates an intense energy that the viewer can both see and feel – Laib explains that it "has an incredible color which I could never paint, because it is far beyond myself, also much more than myself. It is not a pigment and not a 'natural' pigment either, like the sun is not a yellow circle and the sky is not a blue painting." Ash is the major component of the work in the second gallery – the eponymously titled Frieze of Life. 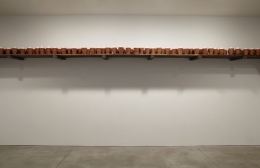 The artist's most recent work, never before shown in the United States, is comprised of a long wooden shelf holding 400 hand-thrown clay pots. 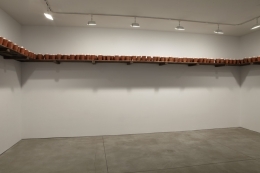 The pots are filled with ashes collected from religious temples near the artist's studio in India. The shelf's placement, high on the wall, is a reference to the ornamental band used as a classical architectural device. As ash is a symbol of both the end of life, as well as a symbol of rebirth, Frieze of Life evinces a powerful testament to the natural cycles of existence. Laib's early training as a physician has given him a unique perspective on these cycles of life and the elements of nature. 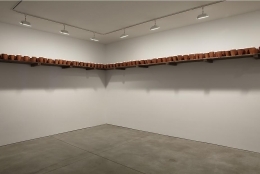 His oeuvre also includes works made of other universally recognized materials, such as rice, milk, stone and wax. In Klaus Ottmann's words, "for Laib, art is an act of participation and of sharing – participating in nature and sharing that experience with others. Laib's works are not merely visual experiences, but serve as his contributions to social and spiritual change." 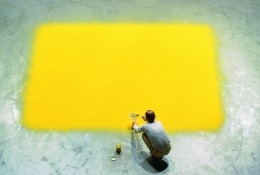 Laib's work has been exhibited extensively, beginning in 1982 with his participation in documenta 7, Kassel, Germany; in 1986 his first official solo exhibition was held in the Musée d'art moderne de la ville de Paris, France. In 1987 he was represented once more in Kassel, at documenta 8. 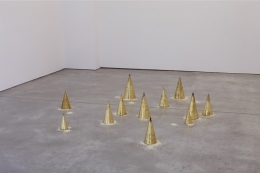 Laib has been the focus of major exhibitions in the Kunstmuseum, Bonn, Germany (1992), the Museum of Contemporary Art in Los Angeles (1992), Kunsthaus Bregenz, Austria (1999/2000), the Hirshhorn Museum, Washington DC (2002), Haus der Kunst, Munich, Germany (2002/3), Fondation Beyeler Riehen, Basel, Switzerland (2005/06) and the Museo Nacional Centro de Arte Reina Sofia, Madrid. 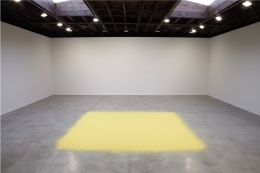 His most recent exhibitions have included the retrospective Without Place-Without Time-Without Body at the Musée de Grenoble, France in the summer of 2008 and the critically acclaimed Wolfgang Laib: Fire Ritual, held this summer at the Fondazione Merz in Turin, Italy. An installation of Without Place-Without Time-Without Body is currently on view at the Nelson-Atkins Museum of Art in Kansas City until January of 2010.